Good for us or not, man has been producing chocolate for a long time. The Maya believed Quetzalcoatl gave cacao to the them after humans were created from maize. They celebrated an annual festival in April to honor the cacao god, Ek Chuah. Several chocolate drinks are described in ancient texts for medical, ceremonial, and culinary uses. Some contain corn, vanilla, peanut butter and honey. Cacoa beans were so highly valued that they were used as currency. Today the world is perhaps even more obsessed with chocolate, and production has increased tremendously. Cocoa production increased from 1.5 million tons in 1983-1984 to 3.5 million tons in 2003-2004 (3). Now, through some bizarre twist, raw foodists, who we could generally call health conscious, are embracing it too. Chocolate is popular with raw foodists and SAD eaters for the same reason that a coffee habit is so hard to shake. People like the high they get off of caffeine and other psychoactive stimulant drugs contained in chocolate (4). The body wants to get rid of these substances quickly, and it floods you with adrenaline. Heart rate increases, the blood pumps, and you feel very alert and alive. This high is not without a cost, however, and rather than providing energy, caffeine essentially steals from tomorrow's energy for a boost today. This is why after the caffeine is out of your system you feel so tired. Your adrenals have been run down a bit, and after long periods of use you can really be in rough shape. Can Chocolate Even Be Raw? Although I haven't tried to make it myself, I've talked to a lot of people who assure me it's impossible to make raw. It's almost always heated, and always fermented. In his blog, "The Chocolate Life," chocolate maker Koa Kahili takes on the idea of raw chocolate. "A lot of people have been asking if Garden Island Chocolate is Raw. My answer is, "there is no such thing as Raw chocolate," he says. "Raw food is all food cooked below 48 degrees Celsius (118 degrees Fahrenheit), as defined by Wikipedia. The fermentation process in cacao generates temperatures as high as 125 degrees Fahrenheit...In conclusion, if "Raw" chocolate tastes like chocolate, chances are it's not "Raw" (5). Even getting fermented but not cooked chocolate is still not a health food. We disregard rotten grapes, but wineries use them for the alcohol that makes us drunk. Fermented cacao is just as decayed. "First, there is no raw chocolate being sold, anywhere," he said. 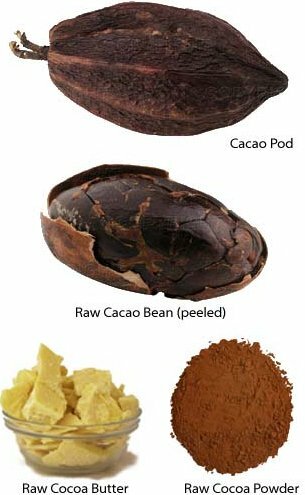 "In order to taste like chocolate, cacao beans must be heated. I have lived in the tropics and have tried to bring out the chocolate taste in other ways, it simply cannot be done. There is no such thing as raw chocolate. Even the chocolate that is fermented so said to be raw is eventually heated, and high enough to be cooked." "I am sure you know that heating the proteins in chocolate denatures them and causes them to become carcinogenic. I assume you are aware that heating the carbohydrates caramelizes them, adversely affecting their GI rating and also creating carcinogens. ...The double bonds of the fats in chocolate become triple bonds under the influence of heat making them physiologically nonviable for humans and adversely impacting upon our cholesterol levels." Raw Chocolate: Heating And Fermenting Below 118 degrees? But could the about voices be wrong? I recently spoke with Vanessa Barg of Gnossis Chocolate, a raw chocolate company. She agreed that much of chocolate marked raw is indeed not raw and that there is a lot of misinformation out there, but assured me that it's entirely possible to make raw chocolate. She's personally supervised production of her chocolate at a factory near Lyons, France to be assured that everything is on the up and up. 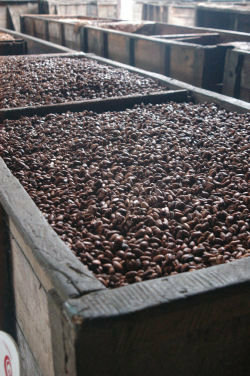 "I chose cacao beans that were certified organic: fermented and dried under 118 degrees. Then I personally dehydrated the beans in a conventional chocolate roaster and charted the temperature every sixty seconds to verify raw integrity. A winnower then cracked the beans into little pieces (nibs) without heat. We then put the nibs into a conventional chocolate grinder and watched the thermostat to confirm that it never reached 118 degrees. The result was a paste that I can personally attest has Raw Integrity." While Vanessa and I do not agree about the merits of chocolate it's clear to me that she's passionate about creating truly raw products and being up front with people. I appreciate that and am willing to believe that she sells a truly raw product by the standard definition of heated below 118 degrees. I updated this article in include Vanessa's point of view because I believe she's telling the truth, and I try to give the most accurate view possible. However, whether or not chocolate has been damaged by heating, it is not a healthy food. If you're aiming for amazing health and vitality, skip the chocolate. Even without raw chocolate, there's plenty of amazing, sweet and tasty food to be had on a healthy raw food diet. Learn what foods are optimal for digestion here. 1) Morozumi M, Hossain RZ, Yamakawa KI, Hokama S, Nishijima S, Oshiro Y, Uchida A, Sugaya K, Ogawa Y (2006). "Gastrointestinal oxalic acid absorption in calcium-treated rats". Urol Res 34: 168. doi:10.1007/s00240-006-0035-7. PMID 16444511. 2) Abbas, Hamed K. (2005). Aflatoxin and Food Safety, CRC Press. ISBN 0824723031. 3) Coe, Sophie D.; and Michael D. Coe (1996). The True History of Chocolate. London: Thames & Hudson. 4) Maughan, RJ; Griffin J (2003). "Caffeine ingestion and fluid balance: a review.". J Human Nutrition Dietetics 16: 411–20.